Includes live cloud and sky texture sync technology and our new real-time advanced shader processor and in-sim interface for live tweaking and saving capabilities. Real-Time Environment Simulation Automation and Tweaking Flexibility. Enjoy instant, on the fly visual feedback, whether you are tweaking the sim to your liking or allowing Environment Force to automatically adjust the environment for you... all while the simulator is running. LIVING DYNAMIC WEATHER AND SMOOTH ENVIRONMENT CHANGES FOR ALL WEATHER ENGINES, INCLUDING REX SKY FORCE 3D, ACTIVE SKY, OPUS, FSGRW, FSXWX AND REX ESSENTIAL OVERDRIVE. The API works on the simulator run time layer and does not change any of the core framework of the simulation. With Environment Force, you can now control the key weather and environment features in real-time, such as: Cloud morphing, sky and cloud coloring, sky and cloud texture swapping, visibility, water coloring and shader control, terrain and object coloring, and cloud / water / terrain / object / scene lighting. Or you can simply set it and forget it, with the WX-influenced smoothing controls for all weather parameters AND weather engines. Accomplish a living environment controlled in real-time, on-the-fly giving instant visual feedback. You can enjoy tweak-free operation known as Automation Mode. This mode allows Environment Force to automatically control and change key environment visuals on the fly, in real-time as dictated by real-world weather. Or adjust visual settings in real-time within the simulator via the in-sim mini UI modal window. Manual Mode will allow you to take control of key environment elements and shape your environment to your liking. Adjust more visual settings in real-time within the sim via the in-sim mini UI modal window. When using a real-time weather engine, this component provides more accurate properties to clouds as they dynamically transition on the fly. You can enjoy tweak-free operation known as Automation Mode. Customize to your liking. Load cloud and sky textures live on the fly or allow full automation dynamics. Requires Sky Force or Texture Direct. We are currently working on an API for use with other texture add-ons. If you are a content creator and would like to interface with Environment Force, contact us! With Environment Force you will be able to experience smooth weather system transitions with ALL weather engines as clouds and weather will smoothly transition in and out over time. The Environment Force API integrates with REX Sky Force 3D. If you have Sky Force, Environment Force will utilize its weather features for the ultimate in smooth weather and visuals. With the power of two components from the Environment Force API, the environment will transition and respond to weather conditions live, on the fly. If the conditions become stormy, clouds change in structure as well as terrain coloring, sky colors, and water functions change in unison. In short, the flight simulator experience is no longer static... it lives! One of the major benefits of our new Environment Force API is that it’s COMPLETELY independent of the often flawed Simconnect platform. Our new Environment Force API not only offers great performance, it also allows us to continually advance and broaden the API for future features. Enjoy a friendly and easy to use, feature-packed application user interface. This video demonstrates some early features from the alpha software build at FS Expo 2018. On the fly preset sharing allows you to quickly get setup with your favorite tweaks from your friends or content creators. Select a preset while the sim is open, click INJECT and voila! Currently the weather and environment remain static, even with real-time weather engines. Environment Force now gives life to a stagnant experience, as the sky and clouds now morph and smoothly transition over time and are always changing in density, size and atmospheric coloring... all in real-time. Compatible with all weather engines, texture/graphics and shader add-ons out of the box. 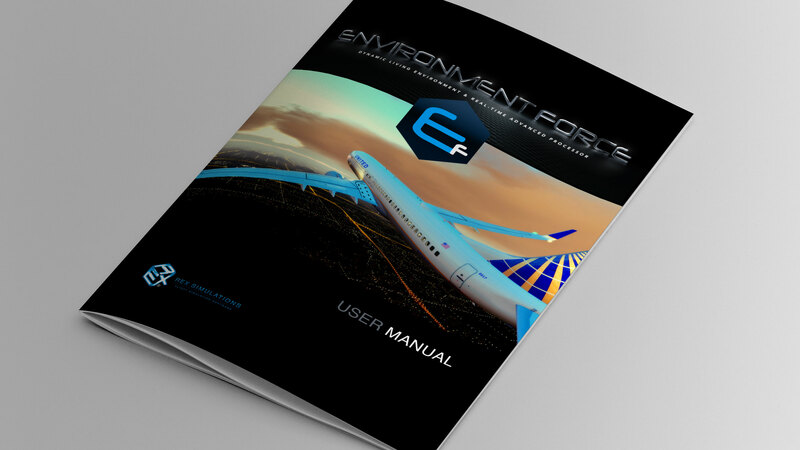 Environment Force is in development, and the user manual will be release soon!